When Great Britain went to war in 1914, so did we. Australia, New Zealand, India, South Africa, Canada, Newfoundland, and many morethe dominions and colonies of the British Empire answered the call of duty throughout the fouryear conflict, adding more than two and a half million men to the British armed forces fighting at sea, in the skies, and on land. On your coin, the goldplated General Service button is paired with a moving depiction of one hero tending to another: one of the thousands of nurses who risked their lives to care for those who fought at the front. Your coin salutes the men and women who served in the British armed forces during the First World War. FOURTH AND FINAL IN FIRST WORLD WAR ALLIES 4-COIN SERIES. On the 100th anniversary of the Armistice of 11 November 1918, this four-coin series reflects on the wartime contributions of select Allied forces who were united in a common cause and bound by heroism and duty. FOUR ALLIES, ONE LAST PUSH. The engraved image is a tribute to the nursing sisters, whose selfless dedication to the sick and injured soldiers earned them the moniker angels of Mercy. THE IMAGE OF COMPASSION. There is a sense of layered depth to the touching yet complex design on your coin, where different finishes place the focus on a nurse and her charge amidst the chaos of a field hospital. Like all coins in this limited series, the selective gold plating on this coin highlights a British General Service button. FOR KING AND COUNTRY. Selective gold plating also highlights the effigy of King George V on the obverse, which largely resembles that of all Canadian coins issued during the First World War. COLLECT ALL 4 COINS FOR THE COMPLETE STORY. Its a touching memorial to all the combatantsone that goes beyond borders to put a face on the Great War. The Royal Canadian Mint certifies all of its collector coins. Most of these are serialized certifications, meaning that each certificate is given a unique number, starting at 1. Your coin is crafted from one ounce 99.99% pure silver. Your coin is GST/HST exempt. 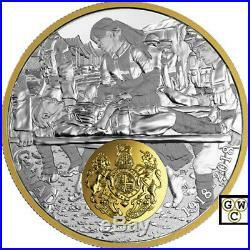 Designed by Canadian artist Pandora Young, your coin depicts a field hospital located near the front during the First World War. While the pointed peaks of medical tents can be seen in the background, the presence of several stretcherbearers and other personnel suggest a battle is underway and casualties are arriving from the front lines. Special finishes place the focus on the British nurse in the foreground, whose quick movements reflect a sense of urgency; keeping pace with the stretcherbearers, her gaze is fixed on the wounded soldier as she quickly assesses his condition while providing words of comfort. The engraved image is paired with the goldplated General Service button. The selectively goldplated obverse features the effigy of King George V by Sir E. Women played an invaluable part in the war effort. While many on the home front volunteered their time and filled factory jobs vacated by those who enlisted, others took on the only military role open to women until 1917: nursing. In Canada, 3,141 women joined the war effort as members of the Royal Canadian Army Medical Corps, including 2,504 who served overseas; in Great Britain, the Queen Alexandras Imperial Military Nursing Service (QAIMNS) counted nearly 10,000 members, while tens of thousandsof voluntary aid detachments (VADs) served as mechanics, ambulance drivers and nurses. In a time when medical advances were made necessary by the very nature of the war, the selfless dedication and compassion of these angels of Mercy made them revered symbols of courage. Most Allied nurses were regarded as civilian auxiliaries, but not Canadian Nursing Sistersthey held the rank of officers (lieutenant) after signing up for service. Your coin is encapsulated and presented in a Royal Canadian Mint-branded maroon clamshell with a black beauty box. 99.99% pure silver with gold plating. Pandora Young (reverse), Sir E. The item “2018’Great Britain-First World War Allied Forces’ Prf $20Fine Silver Coin(18591)” is in sale since Friday, January 11, 2019. This item is in the category “Coins & Paper Money\Coins\ Canada\Commemorative”. The seller is “gatewestcoins” and is located in Winnipeg, Manitoba. This item can be shipped to Canada, United States.